How about putting your dog in a tux for your special day? Kaycee English considers her dog Bowser part of the family, so including him in her wedding was an obvious choice. Hadn't she spent the year before her special day scouring Petfinder.com, wishing she could adopt a dog? Hadn't her husband, John, taken the lead on talking their landlord into allowing a pet? "I really wanted everyone that I loved there that day," said English, who lives in Freehold, N.J., and dressed Bowser in a tuxedo T-shirt for ringbearer duty. The idea of dogs walking down the aisle or sitting for wedding photos may be strange - even repulsive - to some, but a little planning can make things run smoothly and bring families closer together. Stephanie Baker of Bowling Green, Ky., said she and her husband, Steven, adopted their blind dog Tucker when his story on Petfinder "tugged at our heartstrings." They rarely leave home without him and felt strongly about including him in their wedding. She made one wedding photo a tribute to her mother, who has cancer. Baker posed in the same position with Tucker as Mom did with her own dog at her wedding 35 years ago. "If it's something that's important to you, do it," Baker said. "If you have strong feelings about wanting to include someone, you'll regret not doing it." Finding a venue that allows dogs may not be as big a deal as you might expect. Jessica Sempek of Skokie, Ill., said she was the first to ask her chosen location if dogs were allowed and the reaction was, "Why not?" Sempek and her husband, Scott Stewart, had a young nephew walk their dogs Lady Bug and Emmie down the aisle. "He took his job so seriously," Sempek said. Once you have your location, be prepared to answer questions about the details, like how long you expect the animals to be there, and many sites will accommodate, said Wendi Hroncich, a wedding planner in Seattle. "Most venues generally want the bride and groom to have anything they want," she said. - Designate someone to be responsible for a dog during the ceremony and to transport the pet there and back. The human should be someone who's not involved in the proceedings. 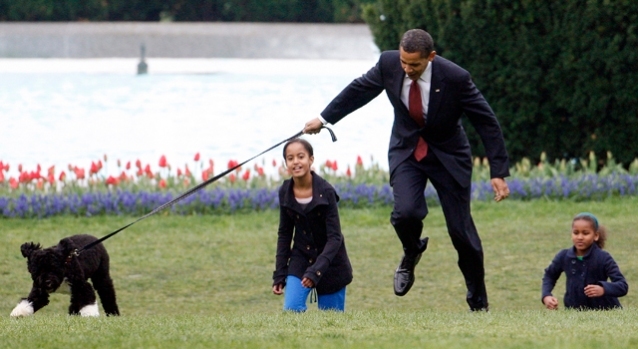 If it's a child's role to walk the animal down the aisle, an adult should supervise before and after. - Don't forget to schedule a dog's trip to the groomer. "They went to the spa just like I did," Sempek said. - If you're boarding your dog after the ceremony, check timing. Julie Hall of Silver Spring, Md., said finding a kennel for her pooch Maddy with late enough drop-off hours was difficult. - Bring treats to help persuade the dog to participate in the photo shoot and make sure it can sit and stay on command. Before her wedding, Hall took her pet to obedience classes. Most couples don't bring their pets to the reception - it's too long and overwhelming - but being part of the ceremony really isn't a challenge for most dogs, Hroncich said. "All they have to do is go down the aisle and then sit." Sempek found that the only unexpected behavior at her wedding was little 9-pound Emmie's reaction to the music. "She wanted to pick a fight with the cellist," she said. "That was the only time they barked all day." In the end, all the couples thought the effort was more than worth it - and reluctant relatives came around. "After the fact," English said, "people look at the photos and say, 'How cute is this one,' and it's always the one with the dog."